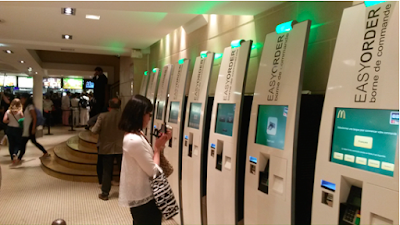 here's a photo I took in the McDonald's on the Champs-Élysées, Paris, of the screens where customers can place their orders and pay. After a short wait, you pick up your burger and fries at the counter. I did not ask just why he is eating at McDonalds in France! "I did not ask just why he is eating at McDonalds in France!" I wonder how much tourism has to do with this, seemingly a bilingual computer is much more efficient than a one-language human. If that is true, it makes good sense why we see more mechanization in this touristy locations first. I live in France and I often travel in France. I can tell you that these machines are everywhere in McDonald’s restaurants, not just in McDonald’s restaurants patronized by foreign tourists. Yes, I also saw them in Paris at the beginning of the year. But they are also putting them in Australia. Probably more to do with high minimum wages, but also high penalty rates: if you want to open your business on the weekend in Australia you must pay more than twice the normal wage rate. If you go to Macdonalds (Or Maccas as they say here) on a Sunday, you only see kids barely out of high school or still in high school taking your order and manning the kitchen. And other coffee shops show the same: just teenagers or very young kids. It's not Dickensian, but it is surely odd. I think the kiosks are going to be obsolete soon enough, too -- people will just use their phones. "If you go to Macdonalds (Or Maccas as they say here) on a Sunday, you only see kids barely out of high school or still in high school taking your order and manning the kitchen"
I'm pretty sure that's because Australia has a staged minimum wage based on age where the youngest workers can be paid the lowest rates. Wasn't high wages one reason the Industrial Revolution started in Britain? I'd be curious to hear your thoughts on what kind of effects you think New York's proposed wage hike will have. NY's fast food wage board recently approved a $15/hr minimum wage, which would effect only fast food workers while the state minimum wage remains at $8.75 (set to increase to $9.00 next year). This seemingly is rather unique in the sense that it's targeted at a specific industry as opposed to applying to all workers. To me this seems a lot more politically driven than anything based on sound economic analysis. Evidence (see Barry Hirsch's article on this) suggests that fast-food restaurants are similar to assembly-lines in that all workers are needed. In the extreme, I would model them as workers and capital being used in some fixed proportion. If so, in the short-run, the minimum wage would have no effect on output nor prices: fast-food places will continue to produce as long as prices cover their variable cost (in this case, the cost of hamburgers, etc.). Only in the long run, which is around 7 years as fast-food places usually update their facilities about every 7 years, some establishments will close as their total fixed costs (including labor) does cover expected revenue. At this point, prices will rise and output and employment will fall (at least relative to what would have occurred in the absence of the minimum wage). This is why many studies find no effect on employment: they focus on the short run. From my own studies, I suspect that the workers hired at $15 will not be the same as those currently earning $9. They will be better "quality". In the mean time, many of the $9 workers will eventually be dumped on the market, reducing wages and employment opportunities for the less-skilled. Previous commentators noted the number of high school age people working at MacDonald's on weekends. As a result their productivity is very low and the training costs are high. This means the value-added through their labor is not worth much. These entry level jobs were never intended to be filled by unskilled and untrained people with families. In fact, when the costs of adding an employee in the US is factored in these entry level people are a net negative contributor to the business at any wage! The typical cost of training, teaching and educating an entry level, English speaking, employee in the US is around US$25,000. For non-English speakers it is much higher. Many of these people have to be taught basic hygiene and social skills. That is why original assumption was that these would be entry level jobs for people with little or no experience or skills, hence low value added labor. Results: Unskilled jobs are automated out of existence or the business disappears. Increasing the minimum wage makes automation more attractive. In Australia a couple of years ago we noticed that we had to place our own orders, frequently pickup our own food and get any condiments we wanted. This is in addition to very high prices for everything. When we inquired about the reason every business owner we talked with blamed the high minimum wage. People trying to force change in the market should look to history and others experience to understand the unintended consequences of what they are proposing. McDonalds is the best and cheapest breakfast in Paris. Don't you think that this substitution was inevitable and that minimum wage laws play only a minor role in accelerating the process? These kiosks are essentially just iPads on a stand and likely cost less than $1k each. The investment could be recovered in weeks. In addition to the obvious advantages, I imagine that they also provide a much better opportunity to influence the customer to buy higher margin items. Red Box killed blockbuster in pretty much this exact same with irrespective of the minimum wage. I can confirm they do the same across Spain. John, in this photo I see 8 kiosks, that seems to be about double the amount of cashiers I regularly see at McDonalds. Wouldn't this lead to more higher wage workers needed in the back of the restaurant to produce all of the additional orders? It seems to me that the kiosks are simply a mechanism to have more capital to pay cooks and use less floor space for cash registers and cashiers. There are many companies that are starting to use machines instead of employees. The first reason is that machines are cheaper than paying high minimum wage to employees. Overall this will decrease spending and increase the company's profit. Another reason is that machines can be more efficient than employees. However, there are some disadvantages with machines which include: malfunction and making errors. In the end, many company will accept this idea because the machine's benefit will outweigh the drawbacks. In the U.S., the minimum wage is starting to rise again. Recently, I went to my local bank and was appalled that there were more machines than employees. The machines were able to do the same amount of work as a bank teller. My local bank used to have 5 bank tellers but now there is only one and three machines. In my own opinion, I do not support this idea because it will create low GDP and high unemployment. Not all technological advancement is necessarily labor-saving. McDonalds will now have to pay to get these kiosks made, workers to work on them, and factories to build their kiosks. There will be less demand for unskilled labor and due to the high minimum wage and the usage of machines, thus creating more unemployment. The productivity will increase due to the lack of unskilled cheap labor and will be more efficient as a whole.